Harvard’s central Title IX office has launched a new website that provides information about the University’s Title IX policies and procedures, continuing a push to better inform students, faculty, and staff about how Harvard responds to cases of sexual harassment and sexual assault. The Title IX office has historically struggled to inform students about Harvard’s Title IX procedures. In a University-wide survey in 2015, 71 percent of respondents said they were not at all or only a little bit knowledgeable about what happens when a student reports an incident of sexual assault or misconduct. The website, called a “Resource Guide,” elucidates various aspects of Harvard’s policy and procedures on sexual harassment and sexual assault. It features sections with answers to questions, including “What is sexual harassment?” and “Who can help me?”, as well as resources tailored to specific populations on Harvard’s campus. The online guide is the culmination of years of work between the Title IX office and other University offices focused on preventing and responding to sexual assault on campus, and expands on existing online Title IX resources. The website is also the latest in a series of efforts the Title IX office has taken to better inform students, faculty, and staff about its work. In April, the office released a new set of Frequently Asked Questions about Harvard’s approach to cases of sexual assault, an expansion on a previous version of the FAQs. The launch of the website comes about a year after the 2015 sexual conduct climate survey found that 31 percent of senior undergraduate women experienced some kind of sexual harassment—termed “nonconsensual sexual contact” in the survey—during their time at the College. The website incorporates the results of the survey. 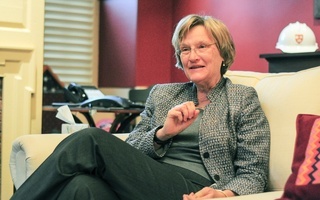 Harvard unveiled new Title IX policies and procedures in July 2014, setting a “preponderance of the evidence” standard during investigations and creating the Office of Sexual and Gender-Based Dispute Resolution. “We really sought out as many resources as we can for the LGBTQ community because we saw in the climate survey results that… there was a real call to action around making sure we have more supports and are being responsive to the needs of the LGBTQ community,” Karvonides said. She said that work on the website began in late 2013. More than 60 people, both University affiliates and other people outside of Harvard, reviewed the site before its launch. 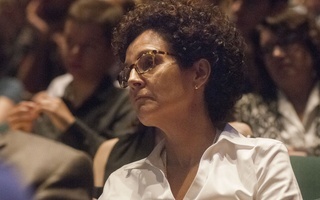 While students are one of the primary audiences for the website, Karvonides said her office also designed the site so that faculty and staff members would also find it useful. The federal government continues to probe the College’s compliance with Title IX in an investigation that began in the spring of 2014. 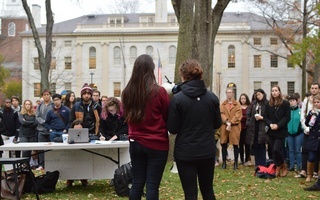 “We’re gonna be pushing for a lot of demands that we’ve been quite vocal about in the past,” Amelia Y. Goldberg ’19, a member of the group, said.